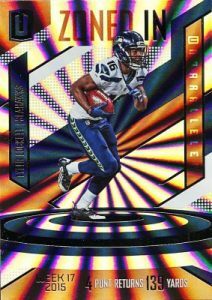 If you are sensitive to bright lights or flashes, 2016 Panini Unparalleled Football might not be the product for you. However, if you appreciate crazy designs and colors, the new brand should be right up your alley. Each hobby box includes one autograph and two memorabilia cards. Complete with glitter and swirls, the base set is hardly basic in design. Collectors are treated to a kaleidoscope of colors and the many parallels amplify that fact. They include Purple, Teal, Orange, Red, Blue, Green, Gold, and Black (1/1). But that is not the whole story as there quite a few designs spread out across the set. See a full breakdown in the gallery below. The main Autograph set features former standouts and current stars with a sticker autograph on the base design. Averaging one in every other box, RPS Rookie Jersey Autographs go with a horizontal layout and medium relic. 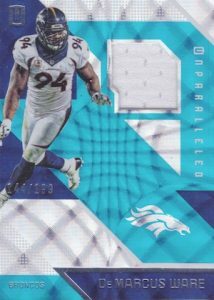 Limited Shield parallels add in an NFL logo patch. 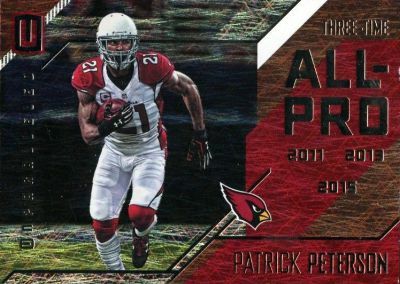 2016 Panini Unparalleled Football also features several inserts that combine to average one per pack. Draft Diamonds highlights the steals of previous NFL Drafts. There are also multi-player options, including Perfect Pairs that celebrate notable teammates and Pivotal Drive which document a trio of players from the same team who combined on a significant drive. PARALLEL CARDS: Purple, Teal, Orange #/99, Red #/49, Blue #/25, Green #/10, Gold #/5, Black 1/1. *See the parallel pattern breakdown on the Product Details tab above. 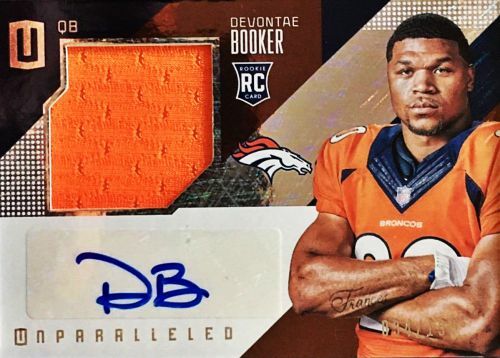 PARALLEL CARDS: Orange #/49, Brand Logo #/2, NFL Shield 1/1. PRIME PARALLEL CARDS: Red #/25, Blue #/10, Green #/5. PARALLEL CARDS: Red #/10 or #/5. 167 cards. Serial Numbered 1/1. PARALLEL CARDS: Orange #/99, Red #/49, Blue #/25, Green #/10, Gold #/5, Black 1/1. 79 cards. Serial Numbered 1/1. 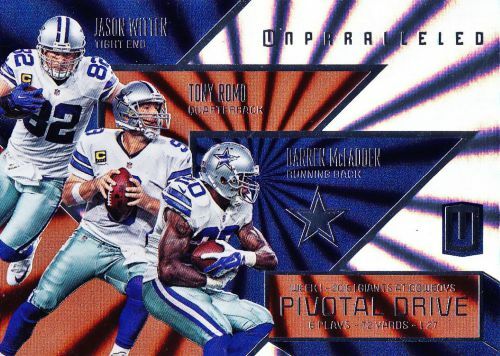 JUMBO PARALLEL CARDS: NFL Shield 1/1, Tag 1/1. PARALLEL CARDS: Orange #/99, Red #/49, Blue #/25, Green#/20, Gold #/10, Black 1/1. 40 cards. Serial Numbered #/299. 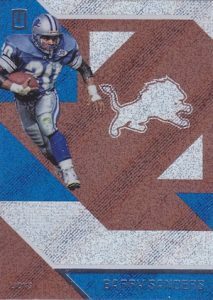 PARALLEL CARDS: Dual #/199, Dual Prime #/49, Triple #/25, Triple Prime #/10, Brand Logo #/2, Triple Tag 1/1. PARALLEL CARDS: Orange #/49, NFL Shield Tag 1/1, NFLPA Tag 1/1. 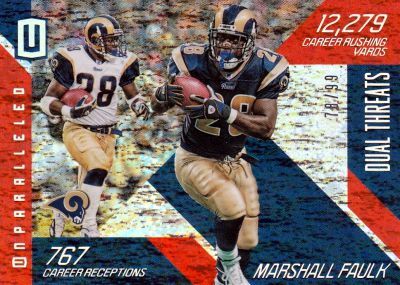 PARALLEL CARDS: Dual #/99 or less, Triple #49 or less. Just as an update from Panini’s Twitter just posted. 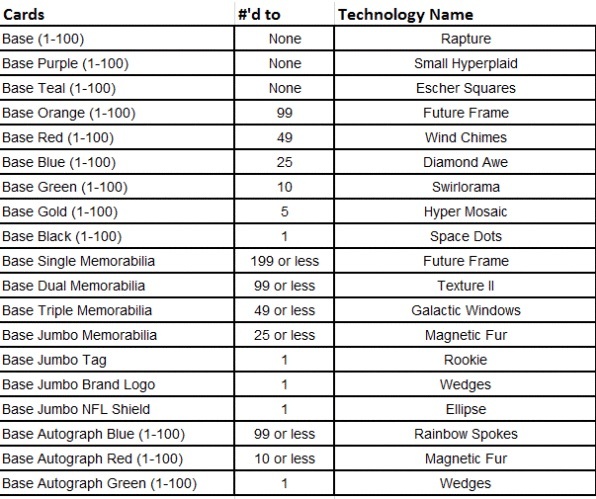 There can be 3 autos OR memorabilia per box. 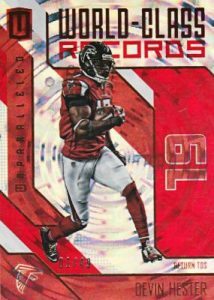 Each box of 2016 Unparalleled Football (10 cards per pack, eight packs per box) will deliver three autograph or memorabilia cards and at least seven numbered cards, inserts or parallels per box. Among the other highlights . . .
Chris Elting � I see that. That is odd since the sell sheet specified one autograph and two relics. 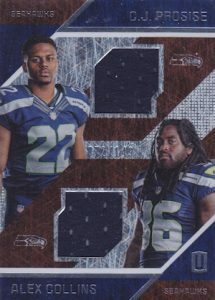 These are nice looking, but why such a small player photo and big open space on the base cards? Looks like they’re copying High Tek with crazy designs/parallels. I don’t like the vagueness with the hits…like Ginter – possible to pull 3 small relics. It’d be nice to know at least 1 auto. I’ll still probably gamble on a few packs tho. Really? First off, 167 auto’s in a product is pretty ridiculous… But out of these 167 auto’s, only 3 Colts players? I mean, Ryan Kelly’s first auto in a Colts uniform will be cool and TJ Green’s first rookie auto will be nice but still.. That’s kinda lame that there’s only 3 Colts players. I just opened 2 boxes of this product and got, 2 autographs, 4 jersey cards, and 6 numbered cards. The box break is suppose to be 1 auto, 2 relic and 7 numbered cards. 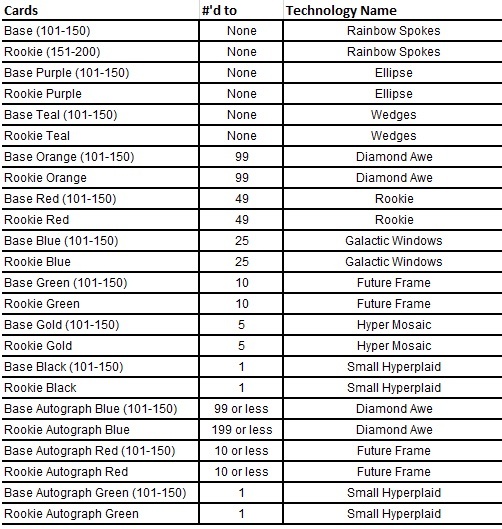 So I would have 6 numbered cards per box if you count the auto and jersey cards. 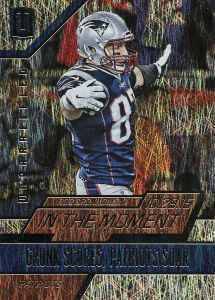 This product is a Topps High Tek wanna be with the different patterns in the background of the cards. 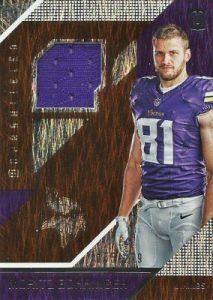 I really don’t like the layout of the cards as well with Panini trying to show the patterns on the cards instead of the players. 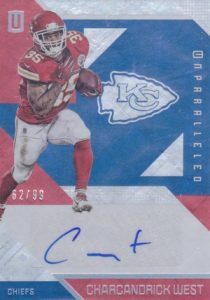 I was one of the lucky openers because one of my auto cards was a Ezekiel Elliott Auto Jersey Orange, but over all I would call this a below average product. 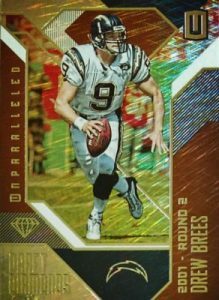 I hate to say it, but I liked their Donruss football better than this product, at least the parallels were numbered so we know how many of each was made. Thanks and hopefully you will enjoy the upcoming football season. Once again a set that has way too many senseless parallels. Design is ok if you like the glitter and glam. Too much dead space on the card as well. Bought a box and got 3 #rd, 2 Gu and 1 auto. 4 short on the numbered. The relics are nice agree to many parallels. Not enough number cards in box but overall a decent set. Tone done the flashy part of the card and make players the base of card. The design should bring the player out more. Design is decent, but too bold. Not enough contrast between player and background. As far as pulls most boxes ive seen either have had a decent HOF auto but not too many good rookie pulls. Alot of /99 parrallels, but again the contrast is off. I had a red windchime parrallel of Montana and at any angle either the player name of team name was unreadable. ANY Steelers parallel is a blinding blur. Fix the color balance and this set can be decent. 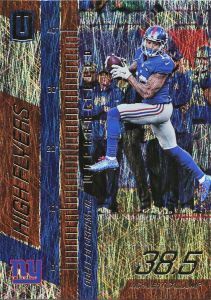 Another 5 star FB product from Panini…….great content and a real money maker if you invest in case. buying a box or 2 of any product is always a huge risk if you are looking to make money. 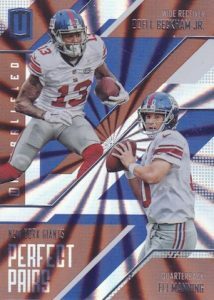 I loved this product I bought three or four hobby boxes and got some really good numbered cards and two one of ones!